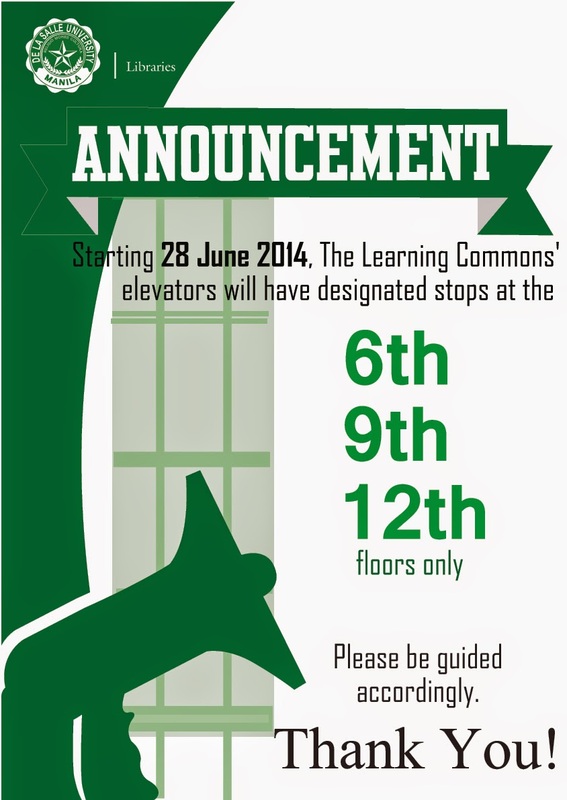 Please be informed that starting 30 June 2014 (Monday), the two (2) elevators of The Learning Commons in Henry Sy, Sr. Hall will serve and stop at floors 6th, 9th, and 12th only. Previously, the elevators serve all the floors from 6th to 13th. The change is part of the efforts of the DLSU Libraries in promoting both energy conservation and healthy, active lifestyles by reducing elevator use and encouraging people to burn a few extra calories by taking escalators instead when moving to only one floor above or below. We appeal for your understanding and cooperation. American Corner Manila has been in constant support of our student body, The Organization for the American Studies, a.k.a, AMSTUD, and as always it lent a helping hand when the organization held its first general assembly on June 26, 2014 at the Roofdeck of the Henry Sy, Sr. Hall. According to Ms. Angelica Mae de la Cruz, the AMSTUD project head, this assembly aimed to promote the unity and awareness of its members by providing a holistic, educational and fun event which also serves as a venue for members to meet one another, as well as to promote the American culture with its theme. A Coachella-inspired style was chosen as the event's theme. Coachella is an indie music and arts festival held annually, usually in the Spring, in Indio Valley, California. Aside from being regarded as a festival of great music, it is also a great way to show the participants' hippie-inspired fashion sides. All the AMSTUDChella attendees were encouraged to showcase their great sense of free-spirited style. The event also highlighted the organization's upcoming programs accompanied by some performances and hilarious games on the side. The Libraries is inviting the community to attend a back-to-back training session on ScienceDirect and Scopus scheduled on 25 June 2014 (Wednesday), 2:00pm - 4:00pm, at the Exhibit Area, 13F of The Learning Commons, Henry Sy, Sr. Hall.ScienceDirect is Elsevier’s peer-reviewed, full text database containing more than 14,000 electronic book titles and more than 2,500 electronic journal titles covering the fields of science, technology and medicine. Scopus is the largest abstract and citation database of peer-reviewed literature with bibliometrics tools to track, analyze and visualize research. It contains over 21,000 titles from more than 5,000 publishers around the world, covering the fields of science, technology, medicine, social sciences, and arts & humanities. Interested participants are requested to kindly fill out this ONLINE REGISTRATION FORM. This training is free of charge. Light snacks will be provided to registered participants. The training is open to (the first) 40 registrants. Registration ends at 5PM on Monday, 23 June 2014. Should you have questions regarding this activity, you may contact either Ms. Janice Peñaflor (janice.penaflor@dlsu.edu.ph) or Mr. Raf del Mundo (rafael.delmundo@dlsu.edu.ph) at the Technical Services, 5F of The Learning Commons, local 601. The Public Affairs Section of the United States Embassy in Manila has invited to the country Dr. Robert Sutter, a Professor of Practice of International Affairs at George Washington University. He is an expert in the following areas: contemporary U.S. policy towards Asia and the Pacific; political, security and economic determinants of change in Asia and the Pacific; U.S.-China relations; salient issues in contemporary China and their international implications; as well as the making of U.S. general foreign policy including the roles of Congress and the Intelligence Community. He has published 20 books, over 200 articles and several hundred government reports dealing with contemporary East Asian and Pacific countries and their relations with the United States. The De La Salle University is very privileged to have him on June 10, 2014, the day when a courtesy call with the Dean College of Law, Atty. Jose Manuel Diokno, was arranged. This was then followed by a forum entitled, South China Sea Disputes – Chinese Assertiveness and America’s Role, hosted by the American Corner Manila in cooperation with The Organization for American Studies. Dr. Renato De Castro, the American Studies Program Coordinator, was also present during the forum to facilitate the discussions. Given the very reliable and respected background of the resource speaker, students eagerly listened and participated on this very interesting session considering the challenge that the Philippines and the other countries in the region now confronts in the face of the current territorial disputes. We are pleased to announce to the community that the trial access to both EBSCO eBook EngineeringCore™ Collection and EBSCO eBook ITCore™ Collection is now available until 30 August 2014. The eBook EngineeringCore™ Collection comprises more than 5,300 titles covering general engineering topics such as biotechnology, civil engineering, electrical engineering, energy sciences, industrial safety, material science, optics and photonics, project management, robotics, etc. This eBook collection contains titles from top book publishers, including Elsevier, John Wiley & Sons, Artech House, ASM International, Institution of Engineering & Technology, and more. The eBook ITCore™ Collection, on the other hand, has more than 2,200 titles covering key subject areas in IT, including content management, desktop and office applications, enterprise computing, graphic design and multimedia, internet and web development, programming languages, telecommunications, and more. This eBook database contains titles from top books publishers including Artech House, Course PTR, De Gruyter, John Wiley & Sons, No Starch Press, MIT Press, CRC Press, Elsevier, Syngress, Sybex and Digitalia. To access these databases in and off campus, please visit the Library's homepage at http://www.dlsu.edu.ph/library/. When you have tried the eBook EngineeringCore™ Collection or the eBook ITCore™ Collection, please click and accomplish this Online Feedback Form (indicate either EngineeringCore or ITCore in the 'Name of online article/journal/ebook database and/or tool' field). Your feedback/recommendations/comments will truly be helpful in deciding whether or not the Library shall subscribe to this database. The Bienvenido N. Santos Creative Writing Center and the Literature Department in cooperation with the European Documentation Centre and the American Corner Manila hosted a forum entitled, In Time of Need, an Open Door: Holocaust Rescue in the Philippines held last June 05, 2014. The speaker, Dr. Sharon Delmendo, a Professor of English at St. John Fisher College, Rochester, NY, profoundly shared her insights and research as she is currently writing the history of the Manilaners, while serving as the Co-Producer and Humanities Scholar of the documentary film on the subject. In addition, she is completing Pacific Theater: Reel War in the Philippines 1939-1950, an analysis of Hollywood-produced WWII films set in the Philippines made while the war was on-going and setting the films in their military and political context of Philippine-American relations during the Commonwealth era. As the American Corner Manila of the DLSU Libraries continue to provide a variety of quality programming to the academic community, a great network of partners is needed to put this into effect. The Organization for American Studies, a.k.a., AMSTUD is the rightful arm of the Corner in carrying out its mission of promoting mutual concern between the Philippines and the United States of America. On June 02-06, 2014, an annual recruitment week was held at the University to gather and encourage students to join an organization they are interested in. Around 120 students enlisted in the Las Vegas-themed AMSTUD booth to become part of the organization. This is definitely a year of good ol’ fun they will never regret. The library in your pocket: our website goes mobile-friendly! As part of the mission of DLSU Libraries to make library services more accessible, we are pleased to inform the community that the DLSU Libraries website, which may be accessed through http://www.dlsu.edu.ph/library, is introducing a mobile friendly version which may be viewed automatically through the use of mobile devices such as smartphones and tablets. The mobile-optimized website enables library users easier access to library services which include the online catalog, online journals, e-books databases, AskLORA services, discussion room reservation and the Library Newsette, among others. An icon may also be saved on the home screen of a mobile device for quicker access of the website. For further instructions, please go to http://libanswers.dlsu.edu.ph/a.php?qid=779390.